Did you know your website could be used to attack other websites? 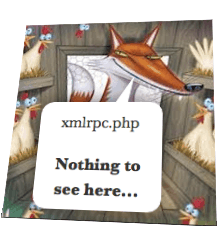 If so, XML-RPC Support or specifically your WordPress xmlrpc.php file may very well have been the reason why. My goal in writing this article is to clarify what XML-RPC protocol is about, share a bit of history, and provide some quick tips for enabling or disabling XML-RPC Support. The WordPres 3.9.2 security update was intended to minimize the impact of excessive connections to the xmlrpc.php script. Here’s the rub, XML-RPC Support, a.k.a., remote publishing, was “OFF” by default in versions of WordPress prior to 3.5. In December 2012, the WordPress folks, believing they had fixed the XML-RPC security issues from earlier that year, forced the default XML-RPC protocol setting to “ON.” And, for good measure then removed the option to turn it off within the WordPress dashboard. Zoinks! Then, later in 2013, distributed denial of service attacks using the xmlrpc mechanism were confirmed again by Incapsula, WordPress Default Leaves Millions of Sites Exploitable for DDoS Attacks. Without going into a long treatise on how or why the XML-RPC protocol can be used and abused, let’s talk about whether you need to leave it “ON” (or OFF!). Do you use any of the applications listed on this WordPress Codex page, use Jetpack, or do you care about pingbacks and trackbacks? Then install these plugins: Disable XML-RPC and if not using a CDN like Cloudflare, install Bad Behavior as well. This null routing method will use less server resources than removing or denying access to the script; which would result in a 404 “file not found” request and additional resources respectively. Disable XML-RPC plugin. The Disable XML-RPC plugin was written to disable the XML-RPC API, but does not disable the trackbacks and pingbacks required by Jetpack and other mobile applications. Remove XMLRPC Pingback Ping should likewise allow JetPack and WordPress Mobile Applications to operate without error. That should give you back much of the XML-RPC system flavor, without the bad pingback taste.